Greek salad, Caprese, light pasta salad, tossed salad – let your imagination run wild. Here you'll find a myriad of simple and healthy recipesforlight meals. 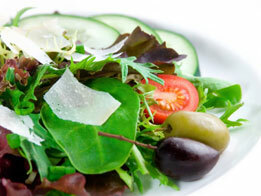 Most salad vegetables are served raw and thus retain all of their nutrients. Especially with salads, freshnessis the top priority. Freshness is reflected in appearance, quality, and flavor. With a good refrigerator, fresh salad can be easily stored for up to a week without loss of nutrients or flavor. Here you'll find time-honored recipes as well as a few of my own favorite creations. Salads are the easiest way to assemble a light and balanced meal that satisfies your personal tastes. Do you want something extraordinary? Experiment! Use different ingredients (fruit? jelly? chocolate?? ), different oils and vinegars, make your own mayonnaise (nothing is simpler). Delight yourself and your guests.